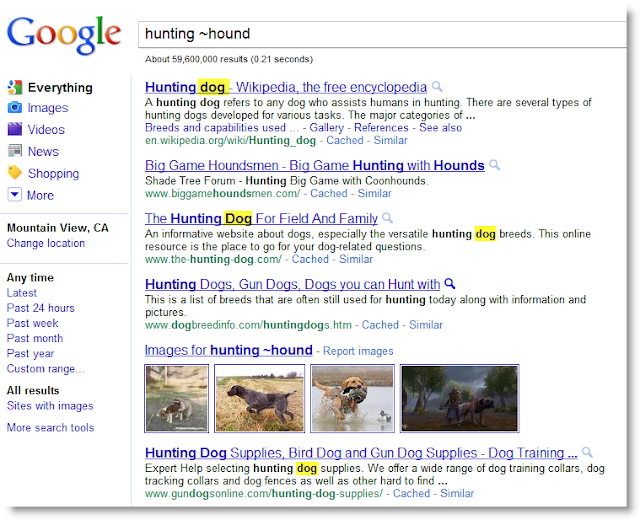 As we saw in yesterday's post, there are a few times when an expanded synonym search is a good idea. Suppose you're flying to the ORD airport (it says so on your ticket). 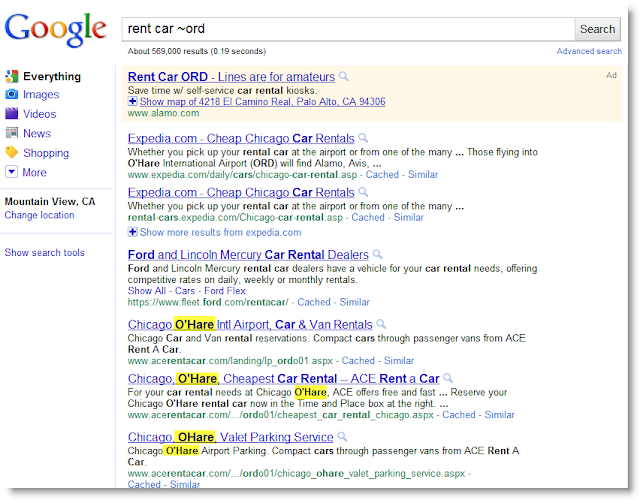 How might you find a place to rent a car? You might it's odd that "fracture" is a synonym, but truth is, Google figures out synonyms not semantically, but by patterns of co-use. Thus, a synonym of Republican is Democrat (they're both used in very similar search circumstances), and "fracture" is often used in conjunction with "bone." You can also see the difference if we put a tilde before hound. 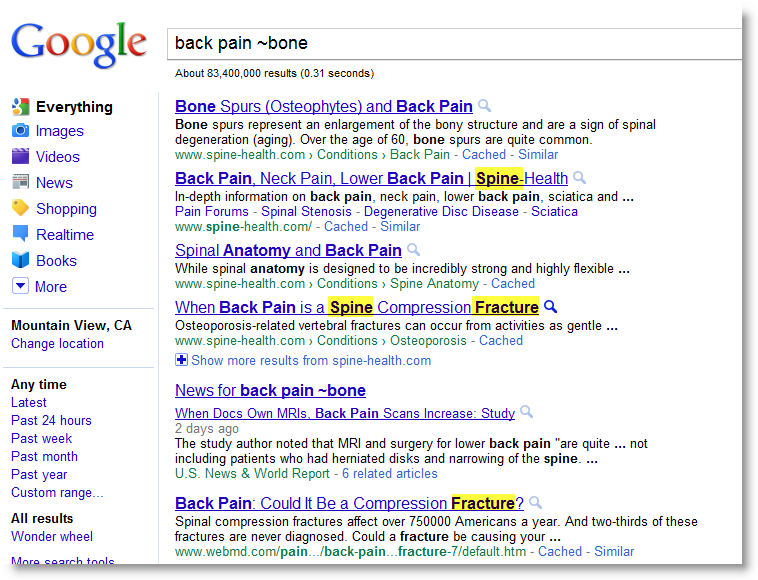 Compare the next two SERPs. The first two results are the same, but after that, the automatically generated synonyms kick in. When should you use the tilde operator? Answer: Whenever you need some suggestions about alternative ways to phrase your query. Use tilde and discover other ways that people talk about your topic! Next week, suggestions and how they differ from tilde! I'm impressed that folks were able to solve this. It thought it would be harder than that. What's more, Ross Nelson found an answer *I* didn't know about! 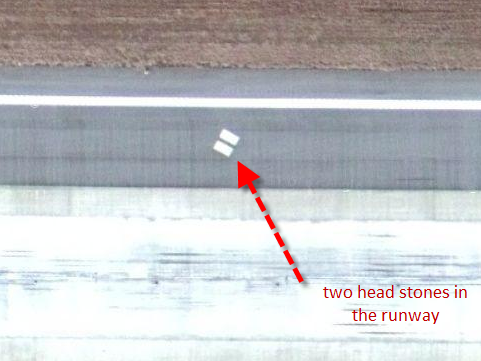 leads to the Wikipedia article on the Savannah/Hilton Head Airport. About 2/3rds of the way down in that article is the comment about the grave markers and the identification that the two markers are "...Some 3,680 feet (1,120 m) from the west end of Runway 10..." Once I knew that, I just used Google Maps to find runway 10, and knowing that runway 10 is 9,351 feet long, I just zoomed in about 1/3rd of the way down the runway and voila, there they were. If you've never seen this before, I'm not surprised. I know about it, but use it about once per year. It means "explore synonyms of this word"! The reason I use it rarely is that Google already automatically checks synonyms pretty aggressively. But as you've seen from other examples, this is one area where Google (well, all search engines) are not great. This is an example where explicitly saying "check the synonyms" is a good tactic. 1. Just 'cuz you found one solution doesn't preclude another solution! 2. When your first search query isn't working, try reformulating.... but look for a different way to phrase the synonym (e.g., "tombstone" for "head stone," or "grave marker" for "head stone"). 3. If you're really exploring synonyms in your query reformulations, sometimes a tilde is just the right tool. Wednesday Search Challenge (April 27, 2011): Headstone in an unusual place? Answer: What's the connection between a men's shoe and John Muir? One of those common styles is called a "wingtip," so-called because the decorative pattern flares back over the shoe giving the tip of the shoe something that looks like "wings." Then, finding a connection John Muir is a bit less obvious. I actually started this whole problem by wondering why wingtips have such an odd pattern. Think about it--why are there holes in the leather of the wing? which led me to the Wikipedia entry for shoe.... and thence to the term brogue shoe (the British term for wingtip shoe). Hans, as usual, got this one first, with Tasha close behind. The search lesson here is that finding connections is sometimes a bit o' fun, and really an issue of traveling down different paths to find the connections, looking out for the points where traces link together. Which reminds me--one of the master of connection-ology is James Burke. If this kind of tracing unlikely threads of ideas from one point to another intrigues you, you'll probably enjoy his Knowledge-Web project. As an example, see his "Goethe to margarine"
BTW -- Happy Birthday to John Muir, born on this day 1838 in Dunbar, Scotland. 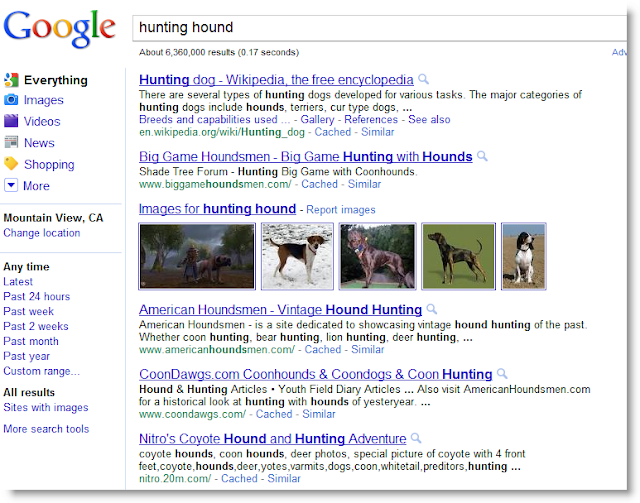 Wednesday Search Challenge (April 20, 2011): What's the connection? Since the AGoogleADay puzzle is going on, I thought I might give you a slightly different challenge for today... more of a puzzle a la AGAD... one that requires (perhaps) a bit more thought than usual. (Since I assume all you SearchResearch readers can do the AGAD puzzle without too much difficulty!). So.. here's a fun, multi-step, chaining kind of problem for you. Let me know if this was too simple for you (or too difficult)! What's the connection between a male shoe style and the accent of John Muir? Can you figure out the most logical (and shortest) path between them? A few people have asked me if the AGoogleADay.com project is really just a clever way of getting people to search more effectively or if we have some other more subtle goal here. 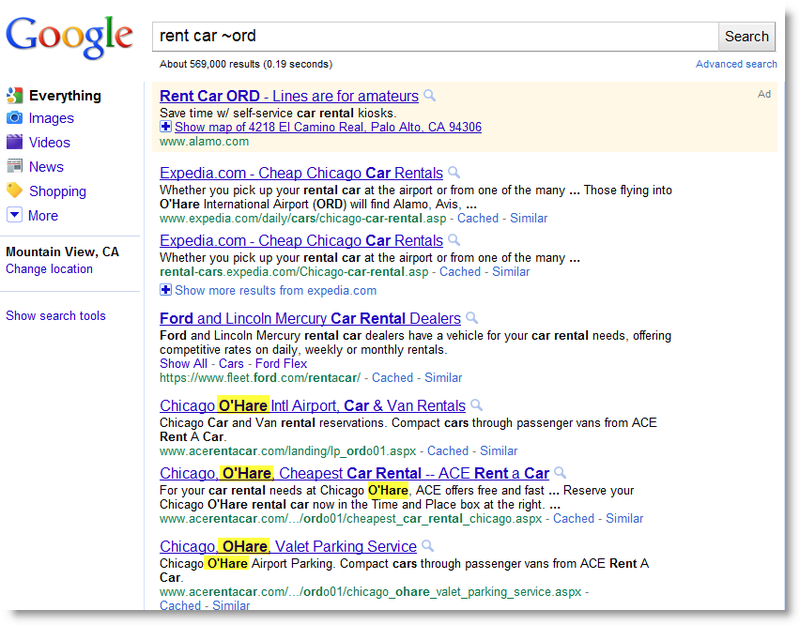 The truth is... We really just want to teach people how to search more effectively. That's a big goal in-and-of-itself. As Ken Denmead writes in his GeekDad blog on WIRED: "Over time, Google has realized that people aren’t using Google to its full potential. Like taking your Lamborghini Miura to the corner store to pick up a lottery ticket, folks haven’t been truly putting the search engine through its paces..."
You've heard me say that before (although not quite as vividly as Denmead). The nuance of AGoogleADay is to teach a subtle through a fun activity that encourages play and exploration. And although we're not giving explicit instructions, I suspect that people who try to solve the puzzle, then read the answer and understand it, will be picking up a good deal of strategic search insight. 2. Chaining steps together. Solving the two future presidents problem ("Two future presidents signed me. Two didn't because they were abroad. Despite my importance, modern viewers seem to think I have a glaring spelling error. What is it?") requires first figuring out what the document was that two future presidents signed AND two future presidents did not (who were also alive at the same time). Once you know that, you can search for [ Constitution misspellings ] and come to know that what once passed for plausible spelling (that is, "Pensylvania"). Interesting side-note: the state is also spelled with a single N on the Liberty Bell, but spelled with two Ns in Article 1, Section 2 of the Constitution. Spelling was more variable in the late 18th century. 3. Reading carefully. In the ferry-to-Iceland problem, ("If you were a ferry passenger traveling from Continental Europe to the country with twice as many sheep as people, in what town would you most likely dock?") many people assumed they knew that the answer was New Zealand and did a query [ ferry Europe to New Zealand ]. But if you think about it for a second, that's a long ferry ride. People who did this query just answered the question without reading the search results carefully.... this is the most common problem among people who are using Google to answer questions. Trust me, there IS no regularly scheduled ferry service from Europe to New Zealand (not in any normal sense of the word "ferry"). How'd you do this past week? Get them all? Miss them all? What's the name of the telecommunications museum in Seyðisfjörður? The only way I could solve this problem was to use the "Translated foreign pages" tool in the Left Hand Panel. There you'll quickly see that the museum is actually called the "Technical Museum of the East," or Tækniminjasafn Austurlands in Icelandic. bryggjuhús from 1881 to 1897. Still, from what I could gather by doing Image searches, a bryggjuhús is a small house next to the water; a vélsmiðja is a kind of shop; and I have no idea what a ritsímastöð is... maybe a section of the country? Since I'm heavily involved in the AGoogleAday.com project, I feel a bit odd ALSO posting a weekly Wednesday search challenge here. I thought about it for a while and realized that what I CAN do is to offer a bit of an extension to the puzzle on Wednesdays. would you most likely dock? And, you probably know the answer by now. (And if you don't, you can go to the site and click on the green "Show answer" button. Here's an extension to today's AGAD puzzle. 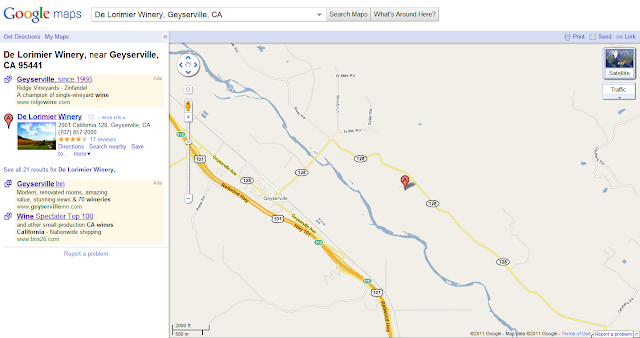 Even though it's a fairly small town, the What is the name of the telecommunications museum in AGoogleADay.com puzzle?? The site for AGoogleADay went live yesterday and judging from the number of Tweets and posts we've seen, it's been a pretty good success. Two future presidents signed me. Two didn't because they were abroad. spelling error. What is it? Searching [two presidents signed two did not] yields the U.S. Constitution. Several people wrote to ask "how can you know who the future presidents are?" Excellent question. Google doesn't have prognostic powers. But the Constitution was signed on September 17, 1787, but George Washington became the first president in 1789. Both he and James Madison were, at the time of the signing, presidents-yet-to-be. Two other future presidents who were alive in 1789 and could have potentially signed the Constitution were Thomas Jefferson, who was in France, and John Adams, who was in Great Britain in September of 1787. 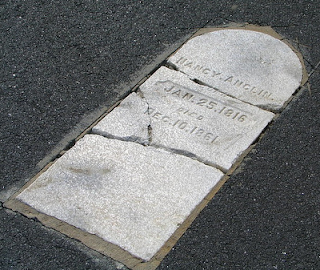 And of course you know that John Hancock signed the Constitution twice. But the interesting bit, from our SearchResearch perspective is how you solved the problem. In general, a long query like [ two presidents signed two did not ] isn't recommended because it tends to exclude parts of the results that you really want to see. HOWEVER... a long query is sometimes called for, especially when you're trying to find a combination concept (concept 1: "two presidents signed" concept 2: "two did not"). In these cases, a longer query is probably required. You really want results that contain both concepts, and trying to intersect results is just too hard to do. Thus, longer queries really are called for.. on occasion. AGoogleADay -- more tough search questions to try! One of the best ways to learn to do something is to make it the point of play. Want to improve your hand-eye coordination? Get out there with a ball and start bouncing! Want to make it to Carnegie Hall? Start playing with friends in a chamber music group. How about playing the Warfield theatre? Start playing with buddies in a garage band. No matter what you do, if you seriously play at it, you'll get better. So for the past several years I've been trying to put together some kind of game that would engage people in a playful way to learn how to search. After many trials, we FINALLY got one version of the "Search Game" out into the world! AGoogleADay.com is a simple game that poses a daily search puzzle for you to solve. The game starts today (Monday April 11, 2011) and will run for the next four weeks with each day's puzzle getting harder from Monday through Friday. We give you the weekend off (to go play those other puzzles, presumably). Here's a sample puzzle from April 8th (we had to test it, don't you know). If you click on the "Show Answer" button, you'll get the answer AND a solution path telling you how to find answers to questions like this in the future. The secret agenda here is to get people to play around with search and to learn all they can do. I've felt for a while like Google gives people intergalactic hyperdrive starship capabilities, but most people only explore the shallows by paddling around with their shuttlecraft! You can share the question each day on Twitter, Buzz or Facebook -- even email it to a friend if you'd like. And once you've worked on it for a while, you can click the "Show answer" button to see how we solved the problem. For the next couple of weeks I'll chat about the questions, both how we came up with the question and how/why we solved it the way we did. Please post your thoughts about the game here, if you would. I'll take them back to AGoogleADay.com world headquarters in Mountain View! See the official Google Blog post. However, I was very surprised to learn that Alpha also has a function to help solve crossword puzzles. 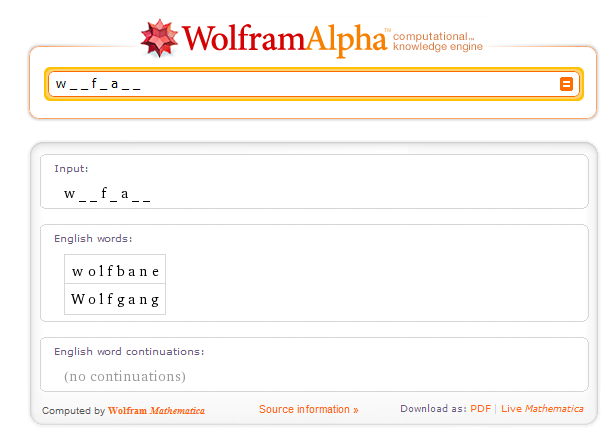 For example if you enter this query [ w _ _ f _ a _ _ ] into Alpha, it will generate a suggestions list, with wolfband and Wolfgang as shown below. NOTE that you have to leave spaces between the underscore characters! 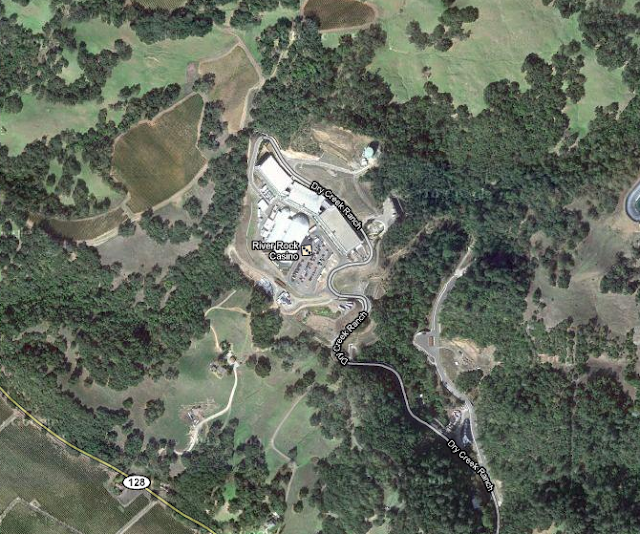 Answer: What's that mysterious building near Geyserville, CA? Quick answers: It's the River Rock Casino, run by the Dry Creek Rancheria band of Pomo Indians. The site is located 260 feet above the valley floor. It took me about 2 minutes to figure all this out. Here's what I did. Toggle into satellite image mode and you can quickly spot the bright whitish spot. Once you're there, you can zoom in a bit and see that the popup tells you it's the River Rock Casino. 2. Now that I knew what it was, I wanted to figure out how high it was above the valley floor. For this I needed the Terrain layer. Click on the Maps icon and find the Terrain layer, then select it. 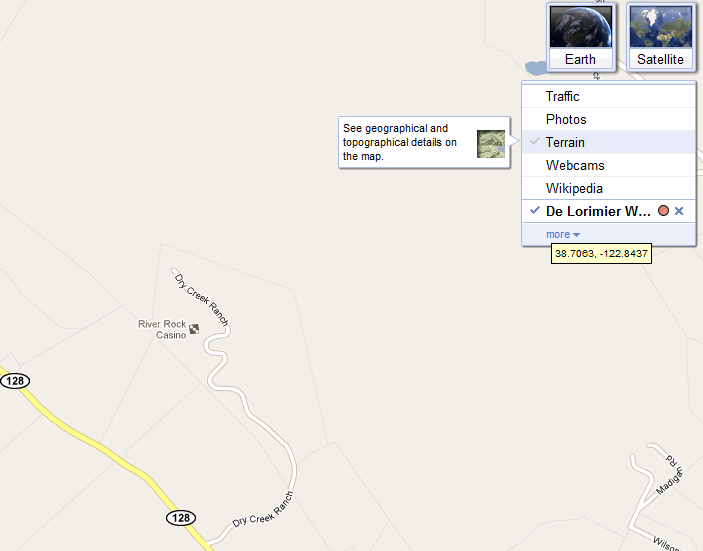 This topographic map then lets me figure out the altitude of the casino. 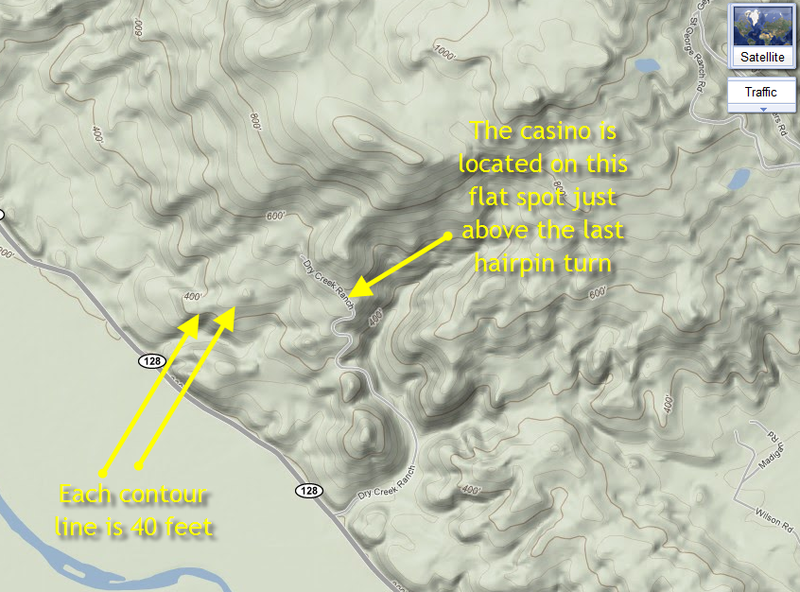 In this case, you just find the major contour line below the casino and count up by 40s (the contour lines are 40 feet apart). This quickly tells you that the casino is located on the 4th contour line (that is, just 40 feet below the 500 foot contour, which is a bit hard to see at this location) -- so it's 460 feet high. By looking at the map on the valley floor you can immediately see that it's at 200 feet. Therefore, the casino sits 260 feet above the valley. One last thing--how to figure out who owns it? In this particular case, I turned on the Wikipedia layer (the same way I turned on the Terrain layer) and found that there was, conveniently, a Wikipedia entry on the Dry Creek Rancheria Band of Pomo Indians. What's the search lesson here? Search lesson: Maps are often a great coordinating device for layers of information; use them when search for location-based information. In this case we were able to go from aerial photo to the map, then from map to the terrain layer. We picked up clues from the Wikipedia layer (of geo-located articles) and measure altitude by counting contour lines. 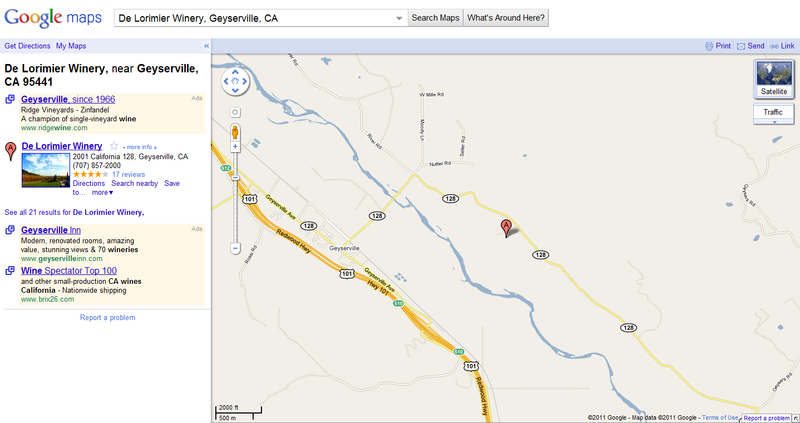 Wednesday Search Challenge (April 6, 2011): What's that odd building near Geyserville? 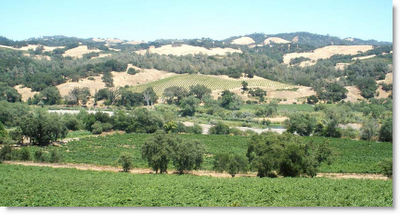 One of the joys of living in northern California is that we're close to some beautiful grape-raising country. Gently rolling hills covered in springtime mustard, great wines, fantastic restaurants, wonderful places to go hiking. 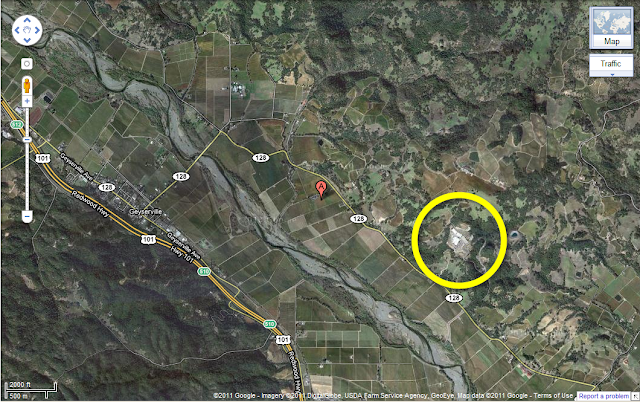 But I saw something that surprised me when traveling north on 101 through the California wine country the other day. Just past where this picture was taken I noticed a really big set of buildings very near the De Lorimier winery in Geyserville. It's a group of 4 large buildings, one that's sort of silvery and looks something like a hangar (with rounded ends). 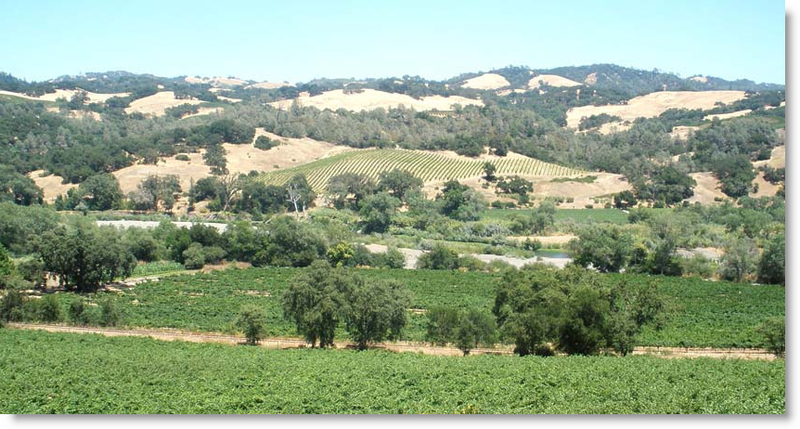 It's in a striking location, perched high above the valley floor with the Mayacamas mountains in the background. Unfortunately, I don't have a picture of it with me, although someone mentioned to me that it's on Indian reservation land. 1. What is this building? 2. How high above the valley floor is it? 3. Is it really associated with an Indian tribe? If so, which one? Some strategies picked up along the way for locating short stories. In general, these kinds of searches are difficult (to say the least). Depending on how much time you can devote to the project, it's a great hunt. The einstellung effect is the mind set you have while solving a problem, and is a wonderfully Teutonic word that basically means "a person's predisposition to solve a given problem in a specific manner even though there are better or more appropriate methods of solving the problem." In other words, it's what happens when you try to keep solving a problem in a particular way, even though there are probably better ways to do so. You get stuck in a particular approach. I taught an advanced search methods class last week, and in that class we saw this repeatedly. We'd teach the class a particular search technique (say, how to use a reverse dictionary for lookup), and then people would keep using that technique, even though it wasn't appropriate for the task they were working on at the time. It's a bit of the "if the only tool you have is a hammer..." effect (but it's said in German, so it sounds more impressive, more psychological). Since our class was the 3rd class in the search instruction series at RAFT (in San Jose) it was the "Advanced" class. And you'd think after 6 hours of instruction that everyone would start to get the sense that not all techniques work equally well in all cases. But einstellung is a natural response to learning something new. If I show you a spiffy new search technique, the obvious thing to do is to try it out on different problems. So it's still a bit of a struggle in the classes to get the students to NOT apply techniques without knowing when they're appropriate. I TRY to tell them the range of applicability, but I'm starting to believe that just telling isn't enough. That you have to let them try the technique on a problem for which is doesn't work, letting them get the hands-on experience to learn when a method is appropriate. This is all a bit counter-intuitive--prior knowledge is supposed to HELP you with solving a problem (in our case, figuring out how to do a search), not limit you. But that's the einstellung effect for you. Our teaching has to take this into account, particularly for teaching search, when you probably don't have a huge amount of time to practice and get over the exciting new thing you just learned. My suggestion: When you show your class a method, show them a case in which is does NOT work. Those negative examples are also valuable for learning.